JEREMIAH 17:7 KJV "Blessed [is] the man that trusteth in the LORD, and whose hope the LORD is." 4And thou, even thyself, shalt discontinue from thine heritage that I gave thee; and I will cause thee to serve thine enemies in the land which thou knowest not: for ye have kindled a fire in mine anger, which shall burn for ever. 5Thus saith the LORD; Cursed be the man that trusteth in man, and maketh flesh his arm, and whose heart departeth from the LORD. 6For he shall be like the heath in the desert, and shall not see when good cometh; but shall inhabit the parched places in the wilderness, in a salt land and not inhabited. 7Blessed is the man that trusteth in the LORD, and whose hope the LORD is. 8For he shall be as a tree planted by the waters, and that spreadeth out her roots by the river, and shall not see when heat cometh, but her leaf shall be green; and shall not be careful in the year of drought, neither shall cease from yielding fruit. 9The heart is deceitful above all things, and desperately wicked: who can know it? 10I the LORD search the heart, I try the reins, even to give every man according to his ways, and according to the fruit of his doings. "Blessed is the man who trusts in the LORD And whose trust is the LORD. A blessing is on the man who puts his faith in the Lord, and whose hope the Lord is. Blessed is the man that confideth in Jehovah, and whose confidence Jehovah is. Blessed is the man who trusts in Yahweh, and whose trust Yahweh is. Blessed [is] the man who trusteth in Jehovah, And whose confidence hath been Jehovah. 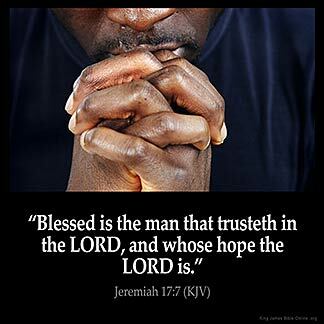 Blessed is the man that trusteth in the LORD, and whose trust the LORD is. I 'm confident because I trust in the Lord an my hope is in him. When it comes to such matters as salvation and genuine peace and security, we are wise to put our trust in Jehovah God alone.